Above: Pauline speaks to Voice of America during an exhibition in Burkina Faso. At 60 years old, Pauline Kangoro is leading a movement in her village. Pauline heads a group of 30 women moringa producers and together they are raising a moringa frenzy in their village of Koukouldi in central west Burkina Faso. In 2013, USAID WA-WASH identified the married mother of four as a leader in her community for the production of moringa and sent her for training at the ICRISAT center in Niger along with a group of nine other gardeners. One year later, Pauline was invited to the Ghana Permaculture Institute to learn how to process moringa for cosmetic uses. Pauline’s accomplishments in promoting moringa demonstrate the effectiveness of the MUS approach, which includes gender mainstreaming to improve sustainable access for households for food security in addition to water, sanitation and hygiene. USAID WA-WASH creates opportunities for women to develop livelihoods in agriculture and livestock. Livelihood activities, like growing moringa, allow women to improve nutrition and food security for their families which in turn allows them the financial resources to invest in water, hygiene and health. Overall, this ensures well-being for their families. Thanks to the production and processing of moringa, Pauline has become the de-facto “head of household.” Through the sale of moringa leaves, seeds and processed products (including powder, soap, and ointment), she is able to meet many of the needs of her family. “Thanks to the project, my family hasn’t known famine for two years and I have even just registered my son at the private college of Koukouldi for 72,000 FCFA,” said Pauline. “Before the Program, I would not have even dreamed of this enrollment.” Through a cost-sharing program with WA-WASH, Pauline has also improved water access in her household by upgrading her traditional well. Pauline is an example of a successful community development volunteer. She has parlayed her decades of experience as a community health facilitator into serving as one of two hygienists trained to promote hygiene and health in the community. For years, Pauline volunteered to support malnourished children in her village based on training she received from the Peace Corps to fight malnutrition using moringa. “I told Peace Corps that with them I had the impression to have gone to America without boarding a flight, but with you I even took the plane,” said Pauline. Pauline plans to continue growing and processing moringa as an income generating activity with her women’s group. 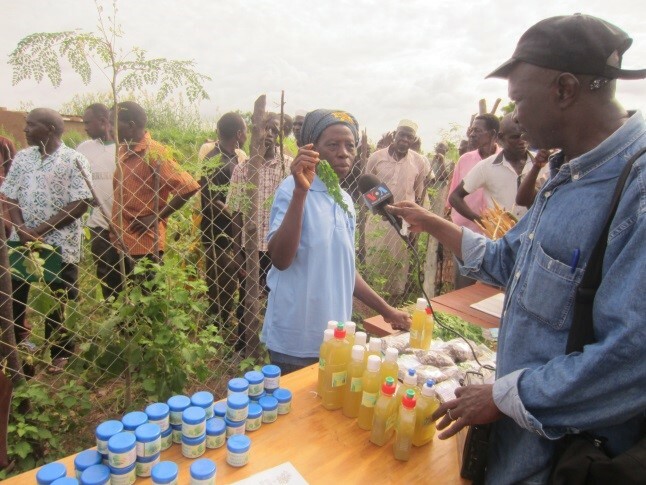 Together, they will move from market to market in neighboring villages to promote moringa and different moringa-based products. So far, her perseverance and passion has paid off: In March 2014, she won first place in the “environment and sustainable development” category at the Agro Agriculture Fair in Tenado.